Short description: UniTransModel web portal is a part of the UniTransModel project which provides end users access to the search functionalities developed in other parts of project. It consists of a web site, through which any member of the general public can plan their trips in the region covered by the project. This includes the development of the UniTransModel web application, development of the communication interfaces for connecting with other parts of the project, as well as the Android application development. The web site is aimed at the general public, specifically people who travel through the region covered by the project. This will include the residents of the region, as well as all others in need of a transport to, from or through the region. The web site is used through a browser, with all popular browsers supported, and with no additional programs or features needed to be installed. The primary goal of the UniTransModel system as a whole is to provide the public with information. 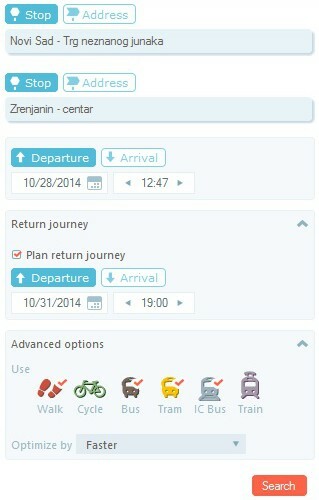 Because of this, the Journey Planner application’s user interface has been designed to be as user-friendly as possible. This means that the data presented to the user is organized in such a way to convey all the required information to the user without overwhelming them with its volume. The user interface for the main Journey Planner route planning functionality has been designed as a single page (Figure 1). Other pages include additional information about the web site, the transport operators, lines, timetables etc. The whole web site is available in three languages: English, Serbian and Hungarian. Specification of various search parameters by the user: start and destination, dates and times of departures/arrivals, means of transport etc. Displaying the results of the search: time of the journey, distance to be travelled, approximate duration of the journey, price etc. Additional pages intended for keeping the public informed: about, contact, directions for use etc. Following is a more detailed description of each of these features. 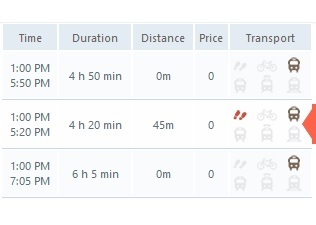 This feature allows the user to start a new journey plan through specifying the parameters for the search. It has two main modes of operation: simple search, which uses only the parameters which are mandatory for the search to be conducted; and an advanced search mode, which will allow the user to provide more details about their journey through additional search parameters. The simple search mode (Figure 2) is used for specifying the start and destination of the journey and the time of the journey. Both the start and the destination can be set by entering the name of a stop (station) or an address. For both, the autocomplete options will assist the user. There is also an option to set the start or destination by pinning them on the map. The time of the journey can be set as time of departure or time of arrival. The advanced search mode (Figure 3) introduces several more search parameters. The return journey section can be used for planning a return journey. Here the user can specify date and time of the return journey (again, as a time of departure or time of arrival to the destination). In the advanced options section the user can select which modes of transport they wish to use and exclude the ones they do not wish to use. There is also the box for choosing the criterion which will be used to select the results which are best for the user: you can prefer the fastest journeys, journeys with the least distance of walking sections or journeys with the minimum number of transitions between different transport vehicles. Once the user is satisfied with the search criteria they have specified, they initiate the search for a journey plan. The results of the search are first shown to the user as a list of all the different possibilities that the search engine has found (Figure 4). The list shows the most important information about the whole journey plan (start and destination, date and time of the journey) and summary information (overall distance, duration price, modes of transport used etc.). This serves as a starting point from which the user can choose to view a detailed description of a particular journey plan. When a journey plan is selected from the list, a detailed view of that journey plan is presented (Figure 5). This includes a list of all sections (steps on the journey) with all relevant information for each section: where and it starts and ends (the name of the station), arrival and departure time, which mode of transport is used on that section, information about that mode of transport, if available (for example, the number of the bus, the name of the transport operator), what distance is travelled on that section and how long will it take approximately. The whole journey is also displayed on the map (Figure 6), with sections presented in different colors (depending on the mode of transport). The user can jump from station to station by selecting a journey section from the list and see all relevant information about the stations along the route. 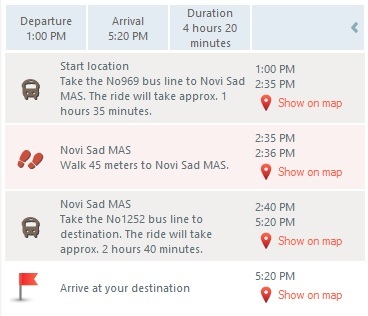 The detailed view of a journey plan can also be displayed in a printer-friendly version. The Timetables section of the site (Figure 7) presents information about transport lines, timetables etc. The user starts by selecting a station (by entering its name or by pinning it on the map). A date and time can also be selected. The search will present a list of all lines which pass through the selected station at the selected time or later. The web site presents basic information about each line (number, name). When the line is selected from this list, its timetable is displayed, with a list of stations it passes through, as well as the times of departure and arrival to/from each station. The line’s route is displayed on the map. This section of the site will provide the site visitor with other information that may be of interest to them. For now, this includes: the About page, which describes the purpose of the web site and how it was created, the Contact page, which contains information about the means of communication of site visitors with its creators and maintainers, and the Help page, which includes a list of instructions on how to use the web site. Since the application also has mobile versions (for Android and iPhone), the web site features links for downloading both versions of the mobile apps. If the user visits the web site through their browser, but from a mobile device, the web site will prompt them with an option to download the appropriate mobile app. Key words: journey planner, public transport, maps. 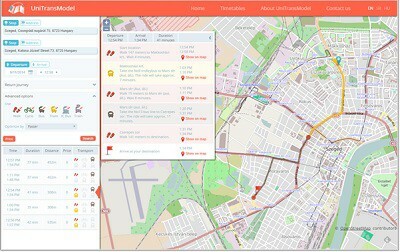 Routeplanner Service – This is the module of the UniTransModel system which provides access to the core search functionality (journey planning). Data Services – This is the module of the UniTransModel system which provides access to transport data. Map Services – These are multiple external web service modules (Google, Bing, MapQuest) which provide map display and different map services (geocoding, routing etc.). The Web Services module serves as a mediator between the core UniTransModel service components (Search Calculator service and Transport Data service) which provide data, and the web application and mobile applications which consume this data. Figure 8 shows the architecture diagram of the web application. 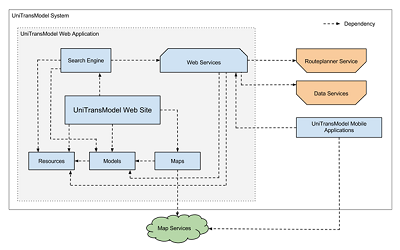 The UniTransModel web application is based on the Microsoft ASP.NET MVC platform. It does not utilize any database, since all data is kept in a central UniTransModel database which the web application accesses using web services provided by other project participants. Some of the data retrieved from these services is cached in order to improve the performance of certain aspects of the application. The services built for the Web Services module are RESTful services based on the ASP.NET Web API framework. 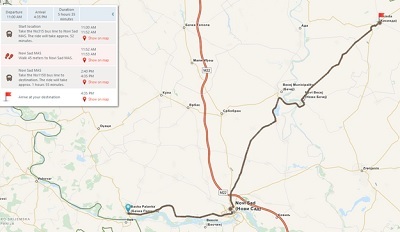 The web application uses maps to display the input parameters of searches (start and destination pins), display the results (station pins, journey route). Also, map services are used for geocoding (finding geographical location of an address, for example), reverse geocoding (finding a description of the geographical location, for example its address) and routing (finding intermediate points between two route points). There are many map services available today that offer these services. In order for the web application to be as flexible and to prevent any limitations which the use of one map service provider might impose, it has been designed to switch easily from one to another. At this time, the application includes implementations for the use of Google, Bing and OpenStreetMap/MapQuest services. Significant results: The beta version of the application has been publicly available since November 2014. This is a complete version of the application, supporting all of the features described here. Initial test results are very encouraging, proving the practical usefulness of the project for the general public. In order to promote the project, several workshops have been organized, and various promotional material is being distributed. This will all help to ensure the project’s wide acceptance. Copyright © 2015 TIAC ◦ ISO 9001:2015, ISO 14001:2015, BS OHSAS 18001:2007 and ISO/IEC 27001:2013 certified.